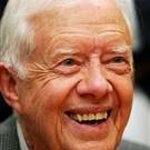 Former U.S. President Jimmy Carter became dehydrated this morning while working at a Habitat For Humanity build site in Winnipeg, Manitoba, Canada. As a precaution, he was transported to St. Boniface General Hospital for rehydration. President Carter was in Canada working on homes as part of the 34th Jimmy & Rosalyn Carter Work Project, which aims to build 150 homes in celebration of Canada’s 150th anniversary. The first day of building kicked off July 10 and will continue through July 14. Projects during the week include: 75 homes in Edmonton and Fort Saskatchewan, 25 homes in Winnipeg and 50 homes in territories and provinces across Canada. Achieving access to an affordable home is increasingly difficult for many Canadians, with 91 percent saying high costs are the biggest barrier to homeownership, according to a recent survey by PSB conducted on behalf of Habitat for Humanity. Additionally, 1 in 7 Canadian households, including 735,000 children, are in core housing need, according to data from the Canada Mortgage and Housing Corporation – meaning that too many families do not have a safe, decent, affordable place to call home. Since 1984, President and Mrs. Carter have traveled around the world with Habitat, donating their time and voices annually to build and improve homes and raise awareness of the critical need for decent and affordable housing. Inspiring millions over the last three decades, President and Mrs. Carter have worked alongside nearly 100,000 volunteers in 14 countries to build, renovate and repair more than 4,000 homes. Country music stars Garth Brooks and Trisha Yearwood will also lend their hands in Edmonton. Brooks and Yearwood, who along with the Carters were named inaugural Habitat Humanitarians, have volunteered their time, skills and voices to Habitat since 2007. 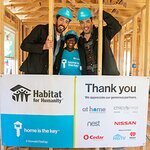 In Winnipeg, long-time Habitat Canada supporter and HGTV star Scott McGillivray will be building homes with volunteers during the week.